Ready for International Dot Day 2018? 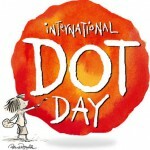 International Dot Day is coming up on September 15th-ish! Join over 10 million in 170 countries celebrating creativity, courage and collaboration!